On December 1, 2015, Toronto’s new City Manager, Peter Wallace, presented an overview of the state of the City’s finances to the Executive Committee. This was by way of an introduction to the 2016 budget which will launch on December 15. Wallace’s talk can be viewed on YouTube, and the slide deck from his presentation is on the City’s site. Wallace’s approach to the budget is a breath of fresh air on two important accounts. First, he believes that the proper roles for Council and for the City Staff are policy and implementation, respectively. Second, he begins the budget cycle without the now-familiar annual exercise of wrestling the “budget gap” down to zero before Councillors even have a chance to review the numbers. These combine to place responsibility for choices and options where it belongs, at Council, rather than having a back-room hatchet job done by staff without the tradeoffs and options ever surfacing for public debate. The City Manager is quite clear: decide what kind of City you want and then figure out how to pay for it. Moreover, Wallace is very clear that the City has been living a charmed existence thanks to very strong revenues from the Land Transfer Tax, and because a large and growing backlog of unfunded capital projects has not been included in the City’s financial planning. Politicians depended on staff telling only good news so that tax cuts and other giveaways could proceed without arousing questions of where the money will come from, or what might not be built without the lost revenue. That was certainly the case through the Ford era and the early part of John Tory’s mayoralty, but this extends even back into David Miller’s term. 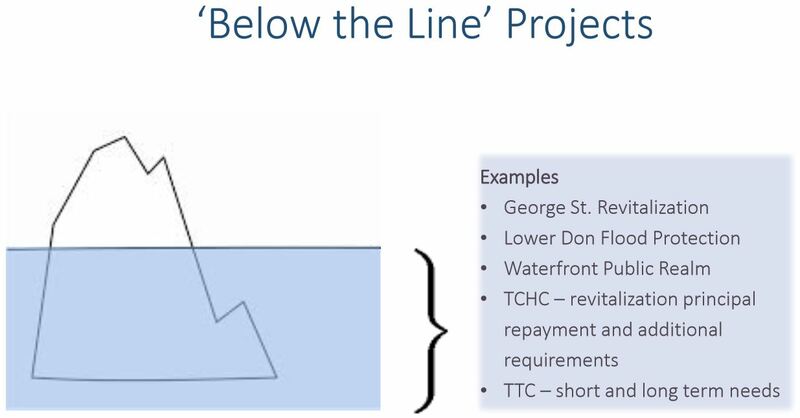 The concept of “below the line” budgeting was used to keep some capital requirements off of the books in hopes of major contributions from other governments, and to make the City’s long-term exposure look less dire to maintain a favourable bond rating. From 2000 to 2015, the total City revenue per capita has grown by 19.7%, and the City’s share of the region’s economic activity has stayed at the same level (in other words, the City has not become relatively a larger or smaller part of the regional economy). What has changed is the proportion of income received from various sources. 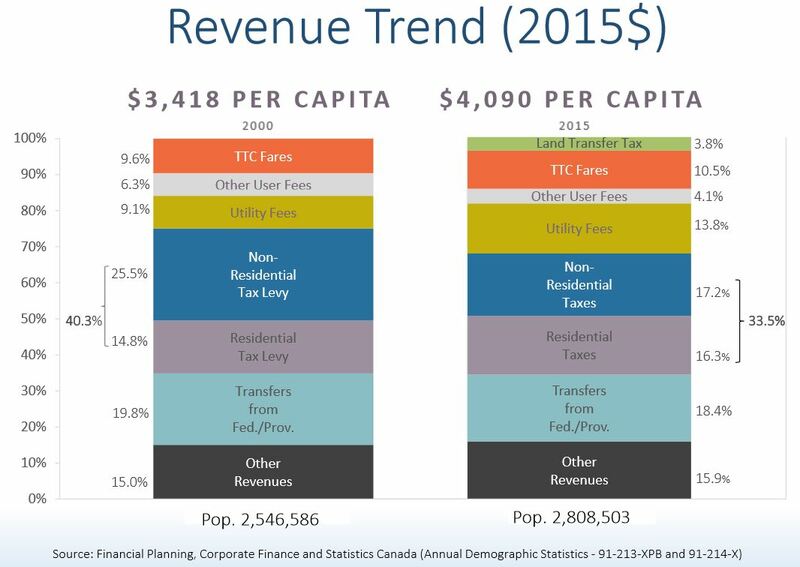 TTC fares as a proportion of the total have risen from 9.6% to 10.5%, Utility Fees have gone up by about 50%, and Other User Fees have fallen. The property tax which formerly accounted for about 40% of City revenue now is only 33.5%. Most of this reduction comes from lower non-residential taxes (about which more below). Land Transfer Tax may only account for 3.8% of total revenue, but that is out of a very large total and it represents several hundred million dollars annually. The evolution of each component’s role over time is shown in the chart below. Property taxes overall have risen slower than inflation since 1998 with the total levy going up about 30% while inflation rose about 45%. However, since 2001, the City’s policy has been to rebalance the relative level of residential and non-residential taxes to match the ratio found in the 905. 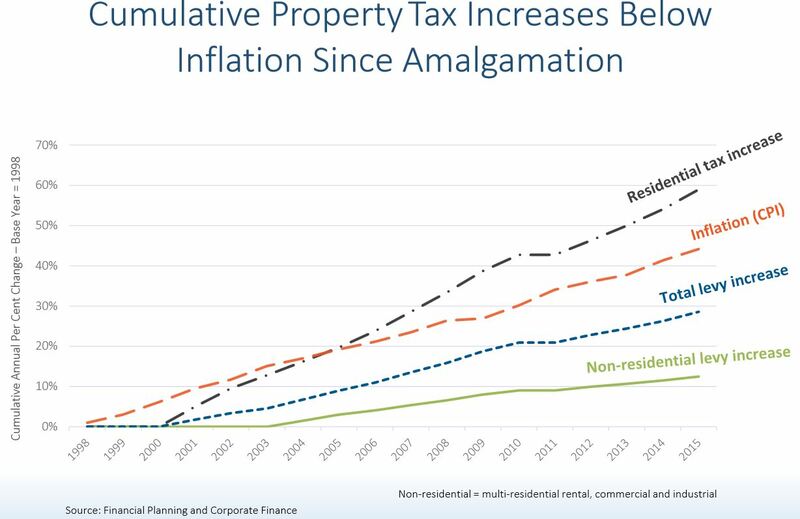 This is done by increasing the residential tax (applicable to houses and condos, but not to rental apartments) at a rate 3 times the increase borne by the non-residential sector. The result is a residential cumulative increase above inflation, and a non-residential increase well below that rate. Looked at another way, the residential property owners in Toronto have carried the lion’s share of tax increases since 2001 including the additional tax to fund the Scarborough Subway Extension. This disparity will continue until about 2020 when the target ratio between tax rates will be reached. From that point onward, all properties will see the same percentage change in tax rates each year. However, we are only now coming into 2016 and the rebalancing policy will be in place through all of the current term of Council making any property tax increases more difficult to sell because of the disproportionate effect on residential taxpayers. Operating expenses must, by provincial law, be balanced with revenues and deficits are not permitted. 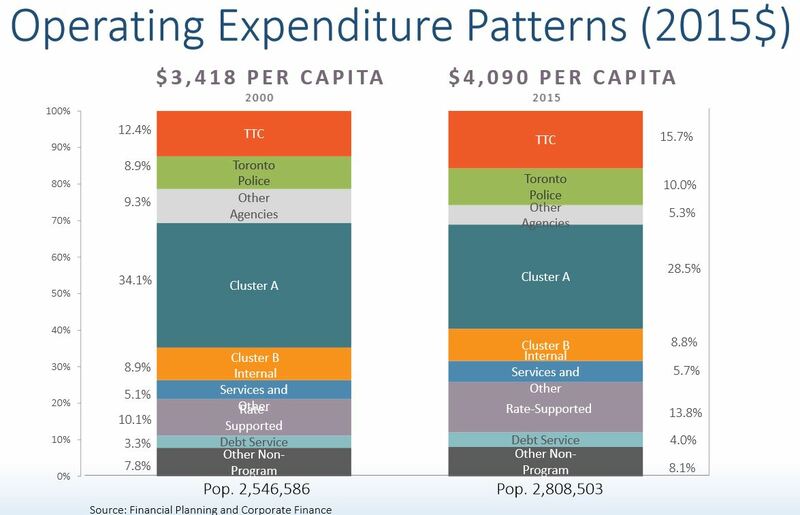 However, since 2015 the areas in which the City has spent have changed with transit and police getting a bigger share, while “soft” service departments (“Cluster A”: Social Services, Housing, etc.) within the budget get less. This also shows up in the chart below that tracks the areas where spending has risen or fallen over the years. Savings from Cost Shared Programs arise mainly from uploading of the responsibility for some services to Queen’s Park. What is unclear here is the degree to which the decline of spending in Cluster A is due to transfer of programs to other governments as opposed to a reduction in services offered. The City Manager’s concern lies more with the Capital Budget than with Operating because Capital plans include a very large, but hidden, component of “below the line” costs. 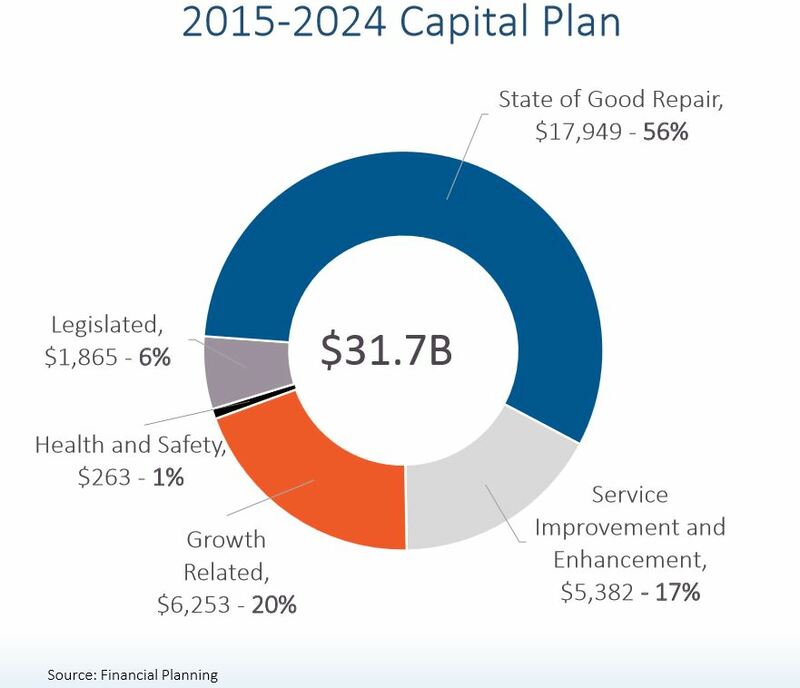 This is the approved Capital Plan, but the chart hides the fact that there is a substantial backlog of “below the line” projects that are not included in the plan because there is no funding identified (city revenues or grants from other governments) to pay for them. 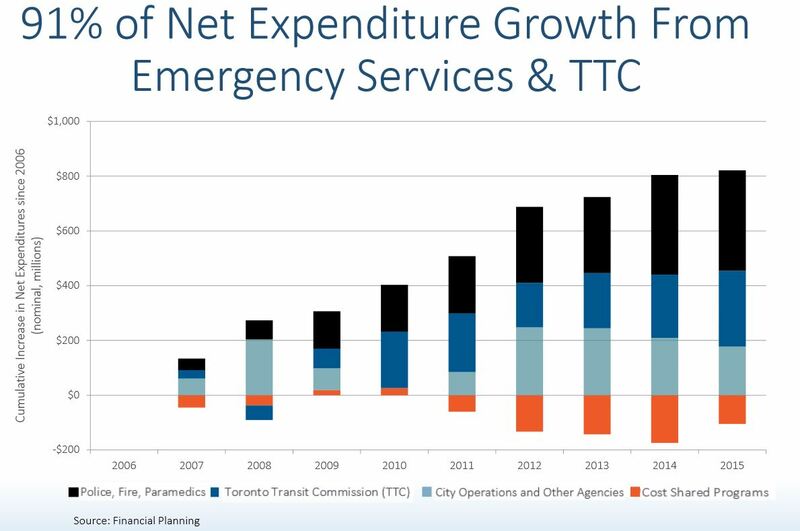 I discussed this in more detail in a recent review of TTC Capital Priorities. In brief, the TTC foresees a requirement for about $9-billion in capital funding over the next decade, of which only 2/3 has known funding. Even if we fill that gap, there is a further list of roughly $5b in other projects that are not even in the formal 10-year TTC plan. At the city-wide level, the below-the-line backlog is about $20-billion. 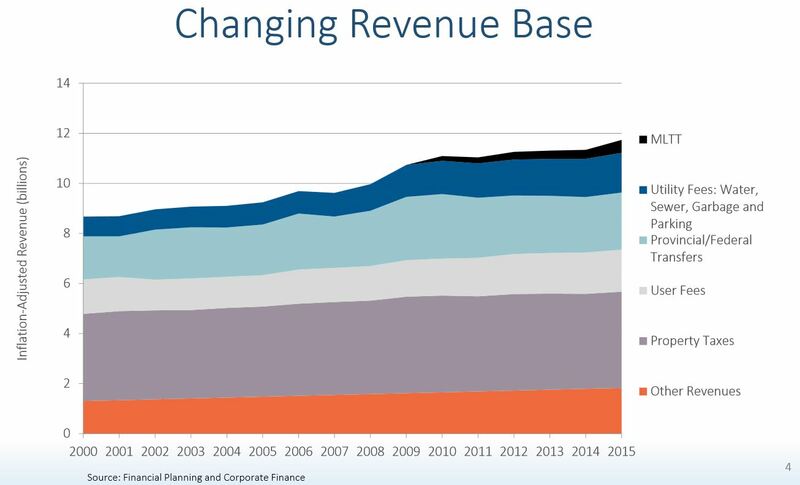 The City’s problem is that the amount of the “iceberg” invisible below the line in the chart above has been growing as new projects heave into view, but old funding streams dry up. Council is happy to add big ticket projects to its future plans, but not as quick to approve ways to pay for them. Notoriously, Council rejected every one of the “revenue tools” available to it under the City of Toronto Act including a repeal of the Vehicle Registration Tax. This may look and feel popular in the short term, but it leaves the City unable to pay for its long term capital requirements. The City Manager is concerned that Capital financing is poorly understood by just about everyone, and inadequate to the City’s needs. The City has a self-imposed cap dictating that debt service costs should not exceed 15% of property tax revenues. Provincial legislation allows a value as high as 25%, but the City prefers to stay well below that line as a matter of conservative planning. In any event, an increase would allow a one-time jump in debt after which we would be facing the same cap on growth of the total debt load, and through that, on the amount of capital spending we could incur year by year. The current income streams allocated to capital are insufficient to support the level of spending Council wishes to undertake. Some capital costs are financed through the Operating Budget by use of annual surpluses, by explicitly budgeted “capital from current” charges, and by dedication of some of the Land Transfer Tax to the capital side of the books. Some capital borrowing has been deferred by spending working funds in the short term, leaving the borrowing as an issue for a future year. The City has begun to finance about $300m that we, in effect, borrowed from ourselves to keep the debt off of the books going into an election year. Moving the capital costs out of the Operating Budget would, temporarily, free up money for other spending, but this would only be a temporary fix. As the City Manager points out, the level of surpluses will fall as the City gets better at budgeting and managing its operations, and the Land Transfer Tax is not a guaranteed source of revenue forever. The capital from current spending is used to avoid debt financing, but if this practice ends, debt costs will go up in the operation budget unless overall borrowing falls. A good argument can be made that paying some capital expenses as they are incurred is a way to avoid borrowing costs. The situation is similar to making a down payment on a house – spend money today to avoid higher mortgage costs tomorrow. Some politicians believe in the Tooth Fairy, aka improved generosity from Queen’s Park or Ottawa. The provincial government has repeatedly said that its funding plans are in place and will not change. As for Ottawa, the new Liberal government talks of a $20b infrastructure fund, but this has to be seen in context. The City of Toronto’s likely share of such a fund will be at best a few billion based on the fact that the City of Toronto has less than 10% of Canada’s population. Even if allocations are skewed toward heavily populated urban areas, Toronto will not see a huge contribution from Ottawa in coming years relative to its total needs. Moreover, some “Toronto” money may find its way into regional projects such as GO/RER, and an open question must be whether the promised Scarborough Subway federal funding will come out of this pot leaving even less for other projects. Toronto Council’s budget hawks are quick to pounce on the “spendthrift” nature of their leftist colleagues, but happily “spend” money that has not actually arrived from senior governments. A follow-on problem is that such programs usually include a requirement for cost sharing by all levels of government. If Ottawa gives us $3-billion, this could bring a requirement for Toronto and Ontario to match them dollar-for-dollar. That new federal money does not come free. Development Charges (DCs) have also been proposed as a source of new money, but this fails on two counts. First, as I discussed in an article about a pending appeal of the charges for the Scarborough Subway, there are rules and formulae about how DCs are calculated. Toronto cannot change these on a whim and without provincial legislative support. Moreover, as a comparatively mature city, a high proportion of any capital investment is deemed to benefit existing residents and landowners in the City, and therefore only a small proportion of the investment can be recouped through DCs. The dollar value of DCs is also not high, and even doubling the rates would not come anywhere near the funding required for Toronto’s backlog. In his State of the City address on December 2, 2015, Mayor Tory talked about a new property tax that could generate new revenue to support capital spending. […] I will be proposing to City Council that we introduce a modest levy that will start in 2017 as the current Scarborough Subway levy concludes. This levy would last for just five years, beginning in 2017, and would see Toronto home-owners contributing approximately $13 per year. For that amount – less than a trip to the movies – we can add tens of millions of dollars per year to the City Building Fund. And we will be able to pay for transit projects across Toronto, just as we are all working together to help improve transit in Scarborough. The Scarborough Subway levy does not “conclude” in 2017. What happens is that in 2016 the rate will top out at 1.6% and it will not rise thereafter. However, the levy is to remain in place for three decades to service the substantial debt Toronto will float to pay its share of the SSE capital cost. Tory’s levy would not “last” five years, but would ramp up over five years with a .5% increase annually. The average home would contribute $13 in the first year, but this would ramp up to $65 by year five and thereafter. The income, from year five, would be about $70m/year. City debt is currently issued for a 20-year term, and each $1-billion of debt would require annual new revenues of about $65m for the life of the debt. A 2.5% tax increase will only scratch the surface of the capital backlog. For the Mayor to make such blunders in a major address begs the question of whether he or his staff really understand how city finance works, or even worse, if the Tory administration continues the style of its predecessor in understating the true cost and implications of its proposals. Remember how Rob Ford claimed that only a 0.5% tax was needed to fund the Scarborough extension? Notably absent from the presentation was any reference to “Tax Increment Financing”, the Mayor’s scheme for building SmartTrack with no extra cost to taxpayers. The economic analysis behind TIF in the Mayor’s election campaign greatly exaggerated its potential for funding new projects, but there is no sense that Mayor Tory is willing to admit what this will mean for Toronto’s financial burden. The City Manager makes a vital point about the respective roles of the City staff and Council. Policy decisions are the role of Council, and the City Manager will not take on that responsibility. Advice on the implications of options and choices, yes, but selection and political accountability remains with Council. In that context, the Budget Launch on December 15 will, for the first time in many years, not include a predetermined set of cuts to achieve balance. Policies such as “finding efficiency” in the many departments and agencies can run headlong into Council directions to implement new programs and preserve existing ones. Although there has been an expectation of a 2% improvement in productivity, the City Manager expects that only 1% will actually be achieved. Service levels must be maintained unless Council decides otherwise. Increases in costs and demand must be funded explicitly. When Council decided to reverse cuts of the Ford years, this had a cost. Moreover, the cost in 2016 will be higher than in 2015 when the extra expense was only for part of the year. (For example, many transit changes were not fully implemented until late in 2015. Some improvements planned for 2016 will not kick in until the fall, and this problem will repeat in the 2017 budget. The 2016 budget will deliver a badly-needed does of reality to a Council and Mayor who have been insulated from the true nature of the city’s financial problems for years. Actually understanding the implications of proposals and decisions will be vital, and this applies across the political spectrum. Open ended promises of lower taxes and more services, let alone capital spending based more on a divisive sense of entitlement rather than true need, must be held to close scrutiny. Political deal making – you support my project and I will support yours – can avoid the need for hard choices between alternatives. Toronto cannot build everything, and Council must choose carefully and intelligently with the money actually available. With such a low ratio of of property tax revenue, every dollar of pressure needs 3 x jump in tax rate proportionally. This report is timely, thanks. There is no money to clear steps, mostly in parks, of ice and snow in winter. Most are barricaded by now. They do this as a cost savings, and to prevent lawsuits from slippery steps. Of course, the city can still be sued if second-class pedestrians dare create their own pathway around the barricaded steps and injure themselves in the process. I think that Toronto should sell its baseball, hockey, and basketball teams to help pay for transit. I think that Hamilton is looking to buy a hockey team. I addition, we can tax things like bad weather, air rights, etc as tax increment financing won’t be enough. What about imposing entry fees for 905-ers or some kind of visa/passport or something? I think that we should look at everything. Steve: The teams are not the City’s to sell, although that would make for interesting campaign promises about “Elect Me and The Leafs Will Win”. RoFo would be in heaven. The CPI figure is not right. Finance Planning is likely using a measure of inflation, but it’s not CPI. CPI from 1998 is about 37%, not 45%. That puts the ‘gap’ with overall property taxes about half as much as shown on the chart. One thing’s for sure: residents have been seeing increases well above inflation for a long time. Does anyone know the split between single and multiple units in Toronto? It’s scandalous in some Ontario cities how much higher the multi-unit rate is. This would only amplify the above-inflation rise in property taxes for condo dwellers. Steve: Which split are you asking about? Number of units, or tax paid by type of unit? I’m pretty sure, Robert was being sarcastic, but an entry fee isn’t that bad of an idea (combined with renewing the Vehicle Registration Tax). The main drawback with the VRT was that people could have cars in York, Peel, etc. and drive into Toronto. If there was a $5/day charge for bringing a car into Toronto ($100 per month or $1000 per year), and a $1/day charge for having a car while living in Toronto ($20 per month or $200 per year), we would both reduce congestion levels within Toronto and raise $300M to $500M per year for transportation and transit improvements. I know the VRT was super unpopular, but part of the problem was the “unfairness” of living just outside and using Toronto roads “for free”. Steve: The VRT was also unpopular because it was attacked by a populist politician as a means of adding to his support, and was a quick-and-dirty tax cut because it was not visibly paying for any benefit. Residential Increases: 53.1% in tax, 133.0% in value. Multi-Residential Increases: 2.6% in tax, 96.0% in value. (31.5% in tax & 151.0% in value to 14.2% in tax & 118.2% in value). I would like to say this is especially troubling, given the massive set of projects that they city needs to undertake. This will likely dry up all at once, and catch the city in the middle of a project, that will suddenly feel less essential, but will also mean that it is not completed, and when growth reasserts itself, the hole will be even larger. The needs to be able to take on many of the projects required to keep it going. If for instance East Bayfront were built, I cannot help but think this would improve the overall financial position of the city. Steve: This is the reason to have dedicated taxes set up to fund some of the major projects. Regular inflationary and market (increased assessment) changes are not enough to fund normal growth in city operations, never mind large capital projects in an environment where this type of spending has not been a routine part of the budget. The 2.5% tax proposed by John Tory is a start, but it won’t fund everything we need. It was interesting to see that the Star called today for the Scarborough Subway to be scrapped (replaced by the original LRT network) and the money redirected to other projects. It will be interesting to see whether, by the time of the 2018 election, any of Tory’s pre-election positions remain unchanged. It’s also interesting to hear Denzil Minnan-Wong talking about a new tax to pay for SmartTrack when, of course, TIF was going to pay for everything like magic. I am very glad to see TIF disappear as an idea. This is in my mind, playing Russian roulette with the city’s finances. It is also adds additional confusion – with regards how, and who gets benefit, and hence where the additional tax is to be collected. You cannot really increase the taxes on standing buildings and housing, and a well (or poorly) placed and considered route will have substantial advantages (or disadvantage), for residents beyond any area directly on or along a route. Any extension of subway at this juncture is likely to have massive negative impacts elsewhere, but anything that diverts substantial load from overloaded points will add massive value across wide portions of the network – how does TIF account for that value, along routes, that are not along or even near the project in question.